We have today launched a new option whereby you can receive a Push Notification Stock Alert immediately when our servers detect potential stock. Previously a member of the Stock Informer team would quickly evaluate any stock and send push notifications if the retailer has a definate number of units for sale. This was introduced to prevent users being bombarded with alerts that sometimes were false alarms or the retailer only had an odd unit in stock which got snapped up immediately. However, you now have the option of receiving immediate alerts sent by our servers the second potential stock is detected. 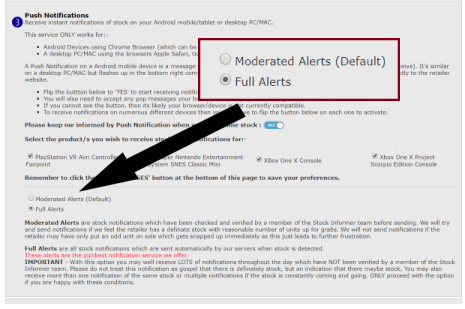 Full Alerts are all stock notifications which are sent automatically by our servers when stock is detected. These alerts are the quickest notification service we offer. IMPORTANT - With this option you may well receive LOTS of notifications throughout the day which have NOT been verified by a member of the Stock Informer team. Please do not treat this notification as gospel that there is definitely stock, but an indication that there maybe stock. You may also receive more than one notification of the same stock or multiple notifications if the stock is constantly coming and going. Open to errors. Moderated Alerts are stock notifications which have been checked and verified by a member of the Stock Informer team before sending. We will try and send a notification if we feel the retailer has a definite stock with reasonable number of units up for grabs. We will not send notifications if the retailer may have only put an odd unit on sale which gets snapped up immediately as this just leads to further frustration. At present all users will default to Moderated Alerts (which has always been the case), however you now have the option of switching to full immediate alerts.